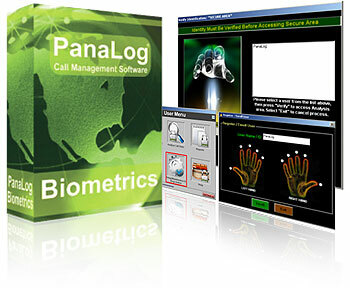 PanaLog Call Management Software with Biometrics Technology helps make your data tremendously secure by distinguishing users by their individual unique fingerprint characteristics. The SecuGen Optical sensor uses "Minutiae-based" fingerprint recognition. Although fingerprint images are initially scanned, the images are not stored anywhere in the system. Instead, fingerprint minutiae (feature points, or key points of the print), are used to create an encoded digital template for authorization and match identification. Users are then recognized via templates whenever they present their fingerprint for authentication. Your entire fingerprint image will never be captured or stored, and fingerprint images can never be recreated from templates. Fingerprint identification allows entry into PanaLog call record analysis areas. Double security level to prevent unauthorized access to private and personal call data and telephone record information activity. 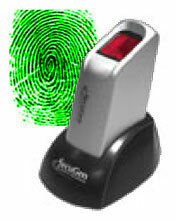 Ergonom ic design provides comfortable fingerprint detection for right or left hand. SecuGen sensors produce very high accuracy rates. The optic design yields practically distortion-free, high contrast images from which data points are used for fingerprint enrollment and matching. An independent test of major biometric products carried out by the International Biometric Group determined SecuGen’s sensor and algorithm achieved 0.0% false acceptance and 0.0% false rejection rates. High quality images mean greater precision, less false rejection, less false acceptance, and better overall performance. PanaLog Call Management Company has selected to include SecuGen optical sensors in our Biometrics Call Management Software to provide the most accurate and reliable interface in the United States to secure our customer’s call data and telephone records.